I have been wanting to blog about Amanda's Squatty Sidekick for the past month or so because I had some adventures in knitting it. But it was a Christmas gift for someone who might see the blog, so I had to keep it a secret. The pattern for this little felted cutie is on the Interweave Press "Knitting Daily" website and can be accessed through the link in the first sentence. The pattern calls for about 200 yards of a feltable (wool) worsted weight yarn, so it's great for using project leftovers. It is knit on large needles, so it takes no time at all to make. I used a few different shades of dark red in Brown Sheep Lamb's Pride Worsted, a good felting yarn, although it takes longer to felt than some. My finished bag showed subtle striping, obscured by the felting for a subtly variegated effect. The problem? 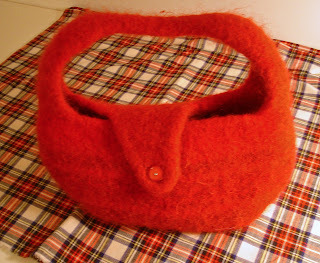 The bag was way too floppy and kind of small even though it measures 11 1/2" wide and 6" high after felting, larger than the finished measurements given in the pattern. My little squatty was so cute that I kept it, but I had to do better. I doubled the yarn (I still had enough reds left over), used larger needles (size 13 US rather than 10 1/2) and decided to widen and lengthen the bag's proportions to make it more usable. This should be a piece of cake. After all, I blog about knitting so I must be very good at it, right? Wrong. My next attempt was so misshapen that I had to frog it immediately or die of embarrassment. I had added stitches in what I thought was a simple continuation of the increase/ decrease sequence of the pattern, but no. It didn't work. The construction of the Squatty is so clever. 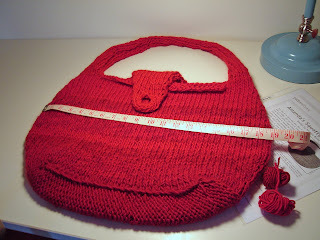 The bottom of the bag is made first as a back and forth-knitted rectangle on a circular needle. The live stitches along one side of the rectangle are kept on the needle and stitches are picked up along the other three sides to start the body. The body (with its careful sequence of increases and decreases) is knit in the round in one piece. At the top of the body, some stitches are bound off and some are kept on a holder for the flap. Others are kept on another holder for the base of the handle. A group of stitches on one side is worked on for the handle. When the handle is long enough, the handle stitches are grafted to the reserved stitches on the other side of the bag. In other words, the bag is made in all one piece. Much more elegant to knit than to describe. Those are some really cute bags. 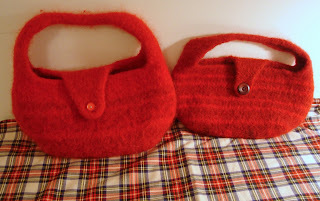 I'm already starting to think of christmas presents to make next year and I want to do bags. I've never done felting though before.